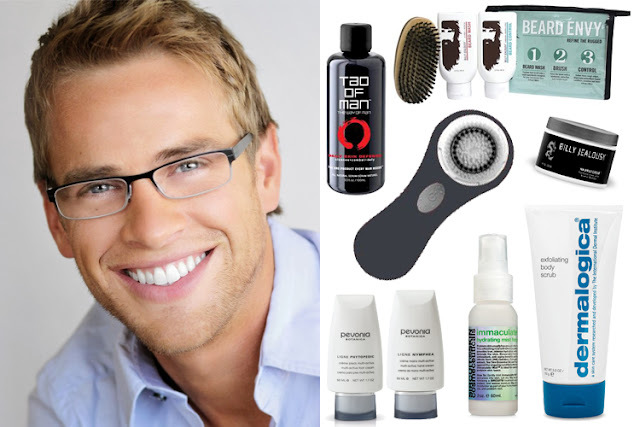 Don't forget the men when beauty gift-shopping this year! True, it may not be your first thought, but pampering him will definitely show that you care. If you're shopping for a well-groomed guy who likes to take that extra step in perfecting his appearance, check out this week's gift guide. If he's a multi-tasker, Tao of Man Daily Skin Defense is his all-in-one cleanser, aftershave and moisturizer. It's also all natural and the glass bottle will certainly look chic on his sink. If he enjoys the occasional mani/pedi, treat him to Pevonia Botanica Multi-Active Hand Cream and Foot Cream. These spa products will pamper him without seeming too "girly." To help buff away the daily grit and grime, Dermalogica Exfoliating Body Scrub is the perfect gift! It's a creamy, foaming and super polishing scrub with the great natural scents of Sandalwood and Patchouli. Just be forewarned, you'll probably find yourself stealing it from him! Is your guy "beardiful" or clean-shaven? For the beardiful beau, keep him looking great with Billy Jealousy Beard Envy Kit. This 3-piece set cleanses, tames and smooths facial hair. For the clean-shaven man, he'll love getting pampered with Billy Jealousy Whipped Cream Traditional Shave Lather. Pair it with an old-fashioned razor for the perfect gift set. To keep his skin looking and feeling great, Sircuit Skin Immaculate Mist controls oil without drying skin, helps blocks UVB rays, while providing anti-aging and anti-acneic benefits. Its spray formula is also super convenient and fits easily into a gym bag. Spoil him gift: Clarisonic Mia. This device will improve his grooming routine and he'll love how great his skin looks and feels! Its compact size and one button feature also make it easy to use. Follow our blog for more helpful gift guides and exclusive details on our Winning Wonderland 2014 Holiday Giveaways! Enter to win our $1800+ His & Her exclusive giveaway now through December 14!! !